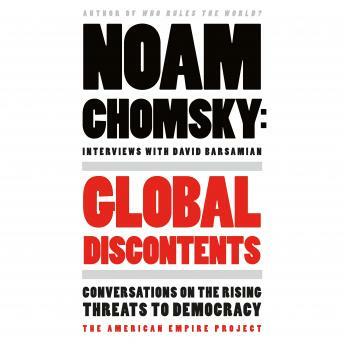 In a compelling new set of interviews, Noam Chomsky's Global Discontents identifies the "dry kindling" of discontent around the world that could soon catch fire. These twelve interviews, conducted from 2013 to 2016, examine the latest developments around the globe: the devastation of Syria, the reach of state surveillance, growing anger over economic inequality, the place of religion in American political culture, and the bitterly contested 2016 U.S. presidential election. In accompanying personal reflections on his Philadelphia childhood and his eighty-seventh birthday, Chomsky also describes his own intellectual journey and the development of his uncompromising stance as America's premier dissident intellectual.